Remove the air-dried vegetables from the package of Crab Cake Mix and soften in 1 tbsp. water in a small dish for a few minutes. Sauté the rehydrated vegetables in butter in a small skillet, then blend in flour and gradually add milk, stirring constantly over low heat until thick. Remove from heat. In mixing bowl, beat the egg, and add lemon juice, mustard, Worcestershire, and hot sauce. Add the cream sauce to the egg mixture. 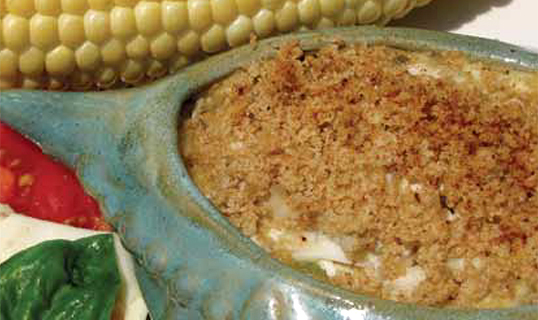 Blend in crabmeat and ¼ c. of the Crab Cake Mix breadcrumbs (save extra crumbs for later). Mix well and spread in the oiled shells or ramekins. Add a little butter to the skillet, and over low heat, lightly butter the remaining breadcrumbs. Spread buttered crumbs over the top of each filled shell, and place shells on baking sheet. Bake in a preheated oven at 375 degrees for 15 to 20 minutes or until golden.